Chocolats Monbana et SucreThere are 8 products. To accompany the tasting of your coffee(café) with your capsules capsul' in, not course(cape), coffeeduck or nexpod, put a capsule - compatibles.com suggests you delicacies consuming without moderation. With the compatible capsules nespresso ® accompanied with roasted coffee specially and delicacies, everything is gathered(combined) to take advantage completely of your coffee break. 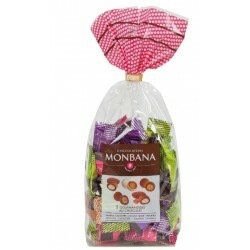 Monbana bag consisting of an assortment of 50 biscuits: Breton pebbles, Mini Cookies, Lemon Palets, Mini Cookies all choco.This bag is ideal to share around a good coffee, to consume with or without moderation. 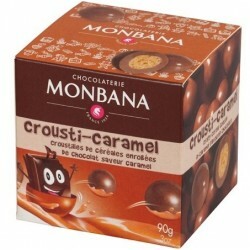 Snack box of Crousti Caramel from chocolate maker Monbana. These are delicious cereal balls coated with caramel. To savor when you want and where you want. 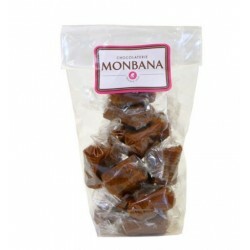 Bag of 150 g of salted butter caramel from the MONBANA chocolatier, to be enjoyed from morning to evening between friends over a good coffee. Box of 200 chocolate squares Black 70% cocoa min. Ideal to accompany your espresso at work or at home this box chocolate vendor Noir Monbana will inevitably be appreciated. 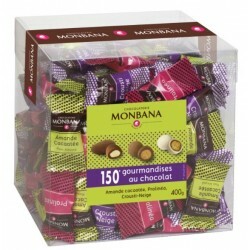 Monbana vending box with 10 flavors of dark chocolate and milk for a net weight of 800 grams. This box consists of the following flavors:Black 70% cocoa min, Black Nougat, Black Cereals, Milk Cereals, Milk Caramel, Milk 33% cocoa min, Milk Praline, Milk Cappuccino, Milk Nougat. Maxi Turbine Box Chocolate Monbana, assorted greed. 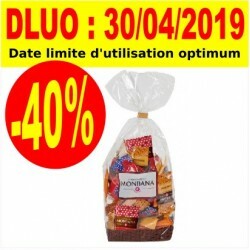 This Maxi Box Turbine chocolate Monbana consists of an assortment of 150 chocolate delicacies: Crousti-Snow, almonds, pralinéa for 400 grams of happiness to share.